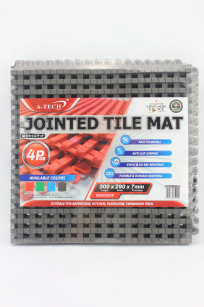 JOINTED TILE MAT – GREY (4PC/PK) is made of Unique Composite PP Material, it is durable yet flexible and is Static & UV RAY resistant and does not fade in colour over time. It`s Anti-slip surface allows user to step on the mat with comfort and safety, the holes allow water to flow under the mat making it perfect for use in areas such as bathroom, kitchen,swimming pool and even kids playroom. It can be easily installed and removed by interlocking mats. Available in 4 different colours to suit consumer`s requirement. JOINTED TILE MAT – RED (4PC/PK) is made of Unique Composite PP Material, it is durable yet flexible and is Static & UV RAY resistant and does not fade in colour over time. It`s Anti-slip surface allows user to step on the mat with comfort and safety, the holes allow water to flow under the mat making it perfect for use in areas such as bathroom, kitchen,swimming pool and even kids playroom. It can be easily installed and removed by interlocking mats. Available in 4 different colours to suit consumer`s requirement. JOINTED TILE MAT – BLUE (4PC/PK) is made of Unique Composite PP Material, it is durable yet flexible and is Static & UV RAY resistant and does not fade in colour over time. It`s Anti-slip surface allows user to step on the mat with comfort and safety, the holes allow water to flow under the mat making it perfect for use in areas such as bathroom, kitchen,swimming pool and even kids playroom. It can be easily installed and removed by interlocking mats. Available in 4 different colours to suit consumer`s requirement. 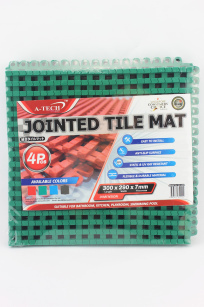 JOINTED TILE MAT – GREEN (4PC/PK) is made of Unique Composite PP Material, it is durable yet flexible and is Static & UV RAY resistant and does not fade in colour over time. It`s Anti-slip surface allows user to step on the mat with comfort and safety, the holes allow water to flow under the mat making it perfect for use in areas such as bathroom, kitchen,swimming pool and even kids playroom. It can be easily installed and removed by interlocking mats. Available in 4 different colours to suit consumer`s requirement. *Sells in assorted colours only! 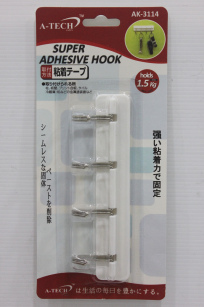 12PC ADHESIVE HOOK (MINI) is the the smallest self-adhesive hook available in the market, It is small making it look almost invisible when applied on the wall. 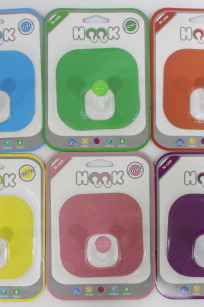 The hook is perfect for holding objects like rags, cloth, etc. 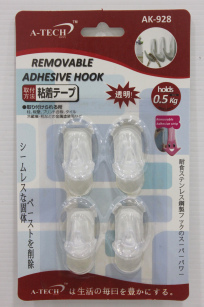 5PC ADHESIVE HOOK uses a long lasting tape that has super adhesive strength, The hook is suitable for a wide variety of applications and is extremely easy to apply onto the surface. Available in a Larger sized 3pc variant. 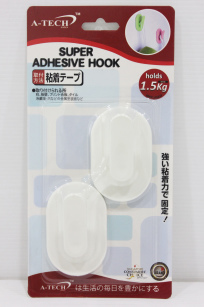 3PC ADHESIVE HOOK uses a long lasting tape that has super adhesive strength, The hook is suitable for a wide variety of applications and is extremely easy to apply onto the surface. 2PC ADHESIVE HOOK uses a long lasting tape that has super adhesive strength, The hook is suitable for a wide variety of applications and is extremely easy to apply onto the surface. 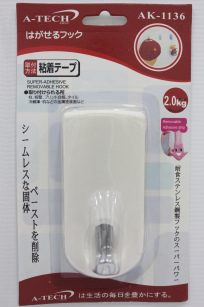 2PC ADHESIVE DOUBLE-HOOK uses a long lasting tape that has super adhesive strength, The hook is suitable for a wide variety of applications and is extremely easy to apply onto the surface. It has double hooks to allow more objects to be hung up, effectively saving space. 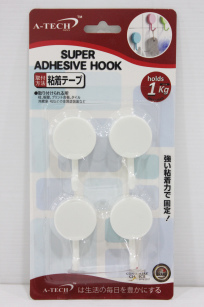 8PC ADHESIVE HOOK uses a long lasting tape that has super adhesive strength, The hook is suitable for a wide variety of applications and is extremely easy to apply onto the surface. It has a unique flat hook design to ensure to keep the wall surface as minimal as possible without the hook protruding out from the wall. 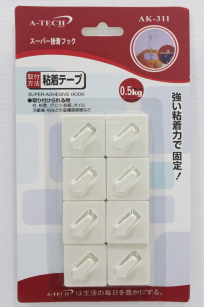 6PC ADHESIVE HOOK uses a long lasting tape that has super adhesive strength, The hook is suitable for a wide variety of applications and is extremely easy to apply onto the surface. 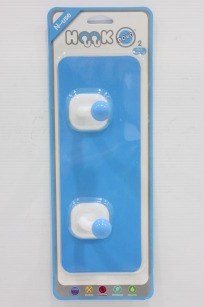 It has a unique flat hook design to ensure to keep the wall surface as minimal as possible without the hook protruding out from the wall. 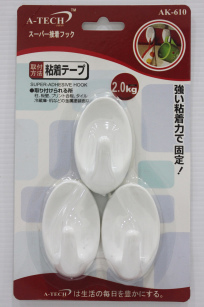 4PC ADHESIVE HOOK uses a long lasting tape that has super adhesive strength, The hook is suitable for a wide variety of applications and is extremely easy to apply onto the surface. 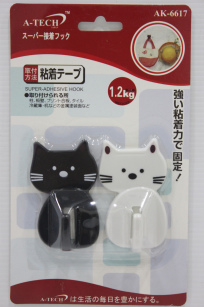 2PC ADHESIVE HOOK (CAT-DESIGN) is uniquely designed with cat-shaped design, despite having a cute appearance, the hook has great adhesive strength and is capable of holding up to 1.2kg of weight. 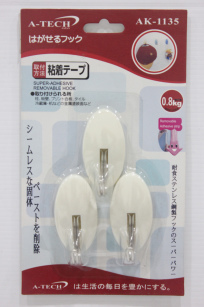 5PC ADHESIVE HOOK uses a long lasting tape that has super adhesive strength, The hook is suitable for a wide variety of applications and is extremely easy to apply onto the surface. 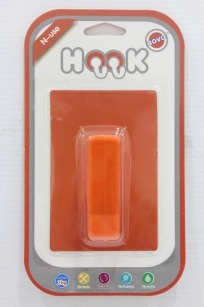 It has a unique colour square patterns that gives the hook a more vibrant look. 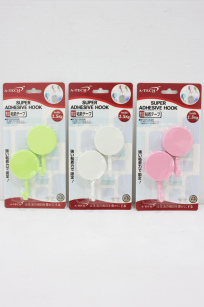 3PC ADHESIVE HOOK uses a long lasting tape that has super adhesive strength, The hook is suitable for a wide variety of applications and is extremely easy to apply onto the surface. 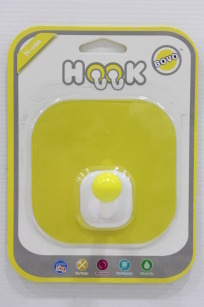 It has a unique colour square patterns that gives the hook a more vibrant look. Available in other sizes to suit consumer`s requirement. 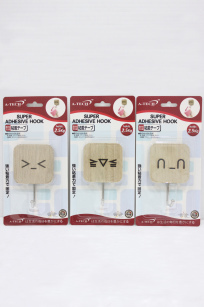 3PC ADHESIVE HOOK uses a long lasting tape that has super adhesive strength, The hook is suitable for a wide variety of applications and is extremely easy to apply onto the surface. It has a unique gold floral patterns that gives the hook a more vibrant look. Available in other sizes to suit consumer`s requirement. 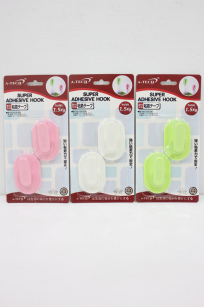 4PC ADHESIVE HOOK uses a long lasting tape that has super adhesive strength, The hook is suitable for a wide variety of applications and is extremely easy to apply onto the surface. It has metallic hooks to gives the hook added strength. 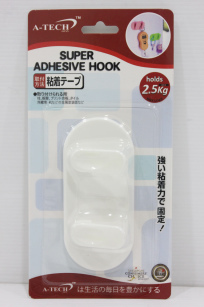 2PC ADHESIVE HOOK uses a long lasting tape that has super adhesive strength, The hook is suitable for a wide variety of applications and is extremely easy to apply onto the surface. It has metallic hooks to gives the hook added strength. 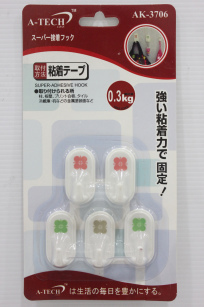 5PC ADHESIVE HOOK uses a long lasting tape that has super adhesive strength, The hook is suitable for a wide variety of applications and is extremely easy to apply onto the surface. It has metallic hooks to gives the hook added strength. 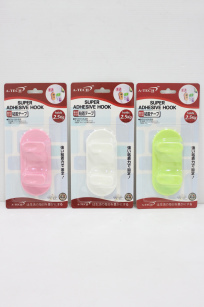 3PC ADHESIVE HOOK uses a long lasting tape that has super adhesive strength, The hook is suitable for a wide variety of applications and is extremely easy to apply onto the surface. 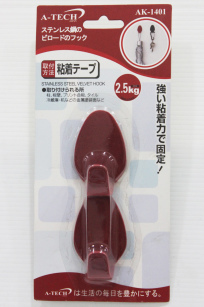 It has metallic hooks to gives the hook added strength. 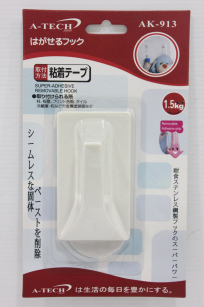 ADHESIVE UTILITY HOOKS is uses tough adhesive that firmly sticks on the surface of your wall and gives it a high weight rating. 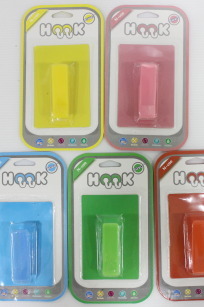 The Hook is a single row plastic piece with adhesive at its back and has 4 Steel hooks that are movable and tough. 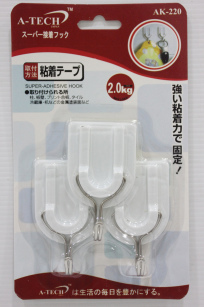 Can be used to hang a wide variety of objects due to the the size of the metallic hook. 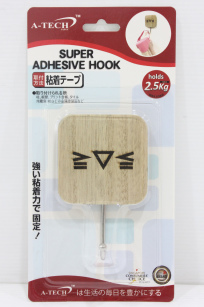 ADHESIVE VELVET HOOK (DOUBLE) uses a long lasting tape that has super adhesive strength, The hook is suitable for a wide variety of applications and is extremely easy to apply onto the surface. It is made of top quality stainless steel wrapped in velvet material. 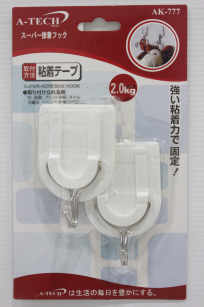 2PC ADHESIVE VELVET HOOK uses a long lasting tape that has super adhesive strength, The hook is suitable for a wide variety of applications and is extremely easy to apply onto the surface. 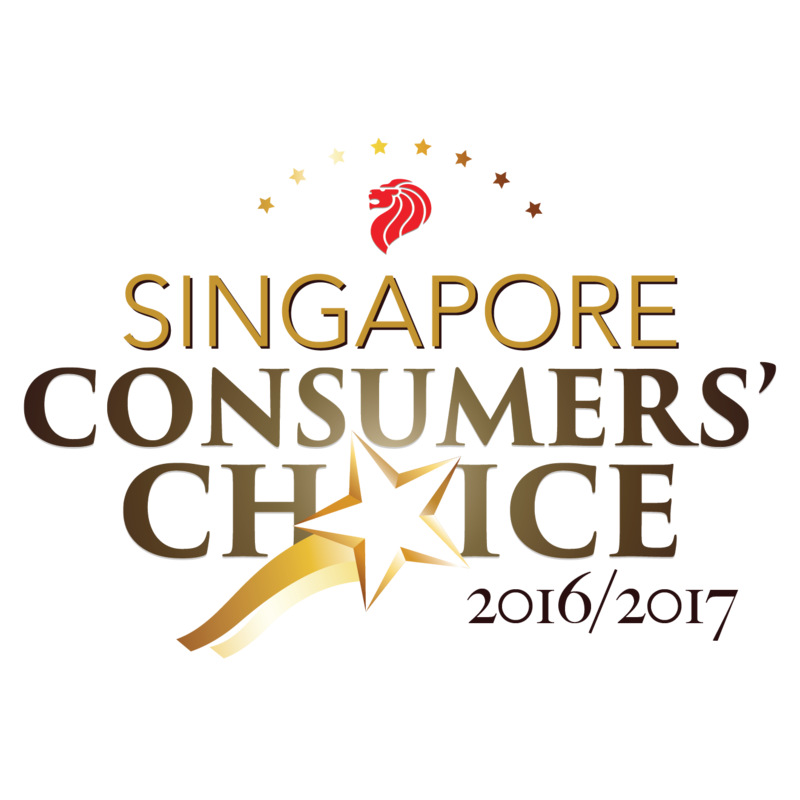 It is made of top quality stainless steel wrapped in velvet material. 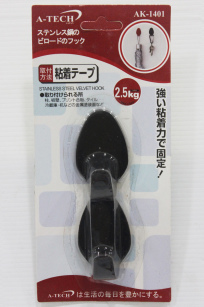 ADHESIVE VELVET HOOK (TRIPLE) uses a long lasting tape that has super adhesive strength, The hook is suitable for a wide variety of applications and is extremely easy to apply onto the surface. It is made of top quality stainless steel wrapped in velvet material. 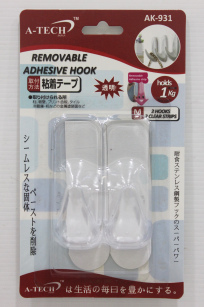 2PC REMOVABLE ADHESIVE HOOK uses a removable super adhesive tape that can be easily removed without leaving any damage or residue on the surface, The hook is clear and invisible when applied onto white walls making it great for hanging small objects. 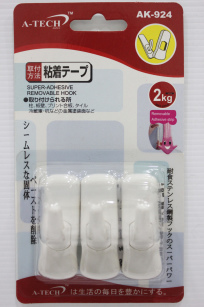 2PC REMOVABLE ADHESIVE HOOK uses a removable super adhesive tape that can be easily removed without leaving any damage or residue on the surface, making it great for temporary hanging of decorations. 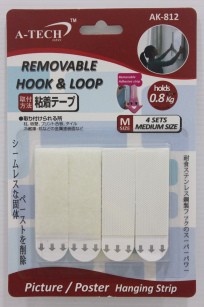 2PC REMOVABLE ADHESIVE HOOK uses a removable super adhesive tape that can be easily removed without leaving any damage or residue on the surface, The hook is clear and invisible when applied onto white walls making it great for temporary hanging of decorations. 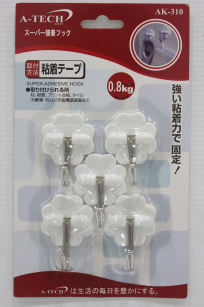 REMOVABLE ADHESIVE HOOK uses a removable super adhesive tape that can be easily removed without leaving any damage or residue on the surface, The hook is clear and invisible when applied onto white walls making it great for temporary hanging of decorations. 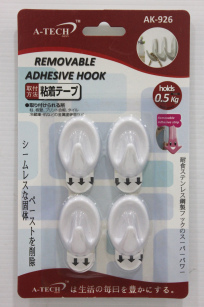 4PC REMOVABLE ADHESIVE HOOK uses a removable super adhesive tape that can be easily removed without leaving any damage or residue on the surface, The hook is clear and invisible when applied onto white walls making it great for temporary hanging of decorations. 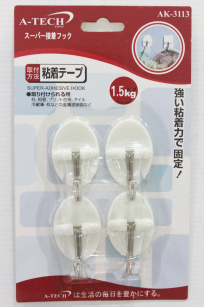 4PC REMOVABLE ADHESIVE HOOK uses a removable super adhesive tape that can be easily removed without leaving any damage or residue on the surface, The hook is clear and invisible when applied onto white walls making it great for hanging small objects. 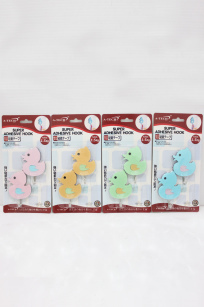 6PC REMOVABLE ADHESIVE HOOK uses a removable super adhesive tape that can be easily removed without leaving any damage or residue on the surface, making it great for temporarily hanging small objects. 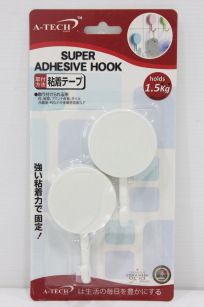 20PC REMOVABLE ADHESIVE HOOK uses a removable super adhesive tape that can be easily removed without leaving any damage or residue on the surface, The hook is clear and invisible when applied onto white walls making it great for hanging small objects. 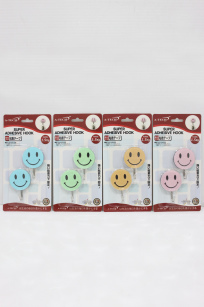 4PC REMOVABLE ADHESIVE HOOK uses a removable super adhesive tape that can be easily removed without leaving any damage or residue on the surface, making it great for temporary hanging of decorations. 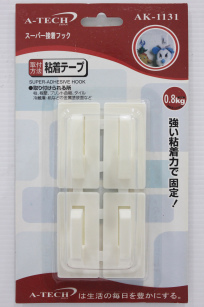 3PC REMOVABLE ADHESIVE HOOK uses a removable super adhesive tape that can be easily removed without leaving any damage or residue on the surface, making it great for temporary hanging of decorations. 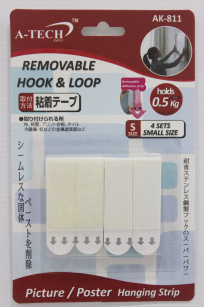 4PC REMOVABLE ADHESIVE HOOK is uses removable adhesive strips that can be easily removed from surfaces of your walls cleanly and does not damage your walls or leaves any sticky residue on it. The hook is suitable for hanging temporary decorations and festive decorations as it can be removed when not in use. 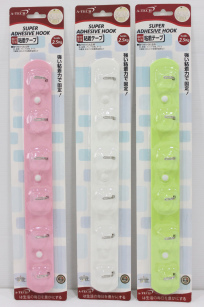 Available in Transparent (Clear) Colour & a Larger size hook (3 piece per pack). 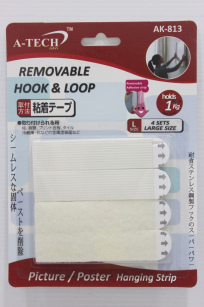 3PC REMOVABLE ADHESIVE HOOK is uses removable adhesive strips that can be easily removed from surfaces of your walls cleanly and does not damage your walls or leaves any sticky residue on it. The hook is suitable for hanging temporary decorations and festive decorations as it can be removed when not in use. 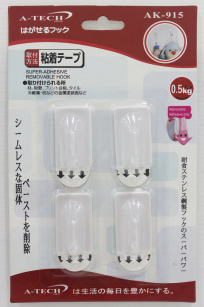 Available in Transparent (Clear) Colour & a Smaller size hook (4 piece per pack). 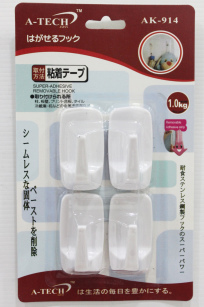 4PC REMOVABLE ADHESIVE HOOK (TRANSPARENT) is uses Clear removable adhesive strips that can be easily removed from surfaces of your walls cleanly and does not damage your walls or leaves any sticky residue on it. The hook is suitable for hanging temporary decorations and festive decorations as it can be removed when not in use. 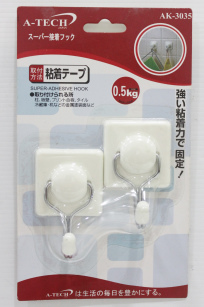 Available in White Colour & Larger size hook (3 piece per pack). 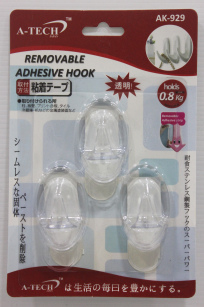 3PC REMOVABLE ADHESIVE HOOK (TRANSPARENT) is uses Clear removable adhesive strips that can be easily removed from surfaces of your walls cleanly and does not damage your walls or leaves any sticky residue on it. The hook is suitable for hanging temporary decorations and festive decorations as it can be removed when not in use. 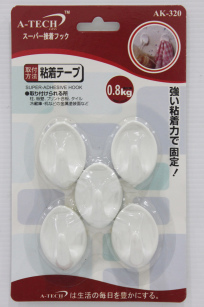 Available in White Colour & a Smaller size hook (4 piece per pack). 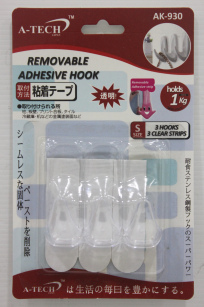 3PC REMOVABLE ADHESIVE HOOK (TRANSPARENT) is uses Clear removable adhesive strips that can be easily removed from surfaces of your walls cleanly and does not damage your walls or leaves any sticky residue on it. The hook is suitable for hanging temporary decorations and festive decorations as it can be removed when not in use. The hook is specifically designed for maximum adhesiveness between the hook and the surface giving it a higher weight rating compared to other hooks of similar size. Available in 3 different hook sizes to suit user`s needs. 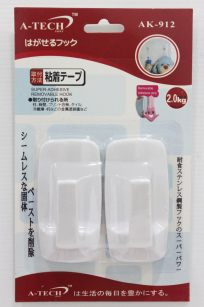 2PC REMOVABLE ADHESIVE HOOK (TRANSPARENT) is uses Clear removable adhesive strips that can be easily removed from surfaces of your walls cleanly and does not damage your walls or leaves any sticky residue on it. The hook is suitable for hanging temporary decorations and festive decorations as it can be removed when not in use. The hook is specifically designed for maximum adhesiveness between the hook and the surface giving it a higher weight rating compared to other hooks of similar size. 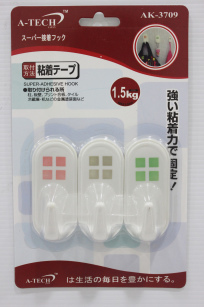 Available in 3 different hook sizes to suit user`s needs. 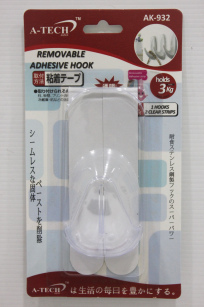 1PC REMOVABLE ADHESIVE HOOK (TRANSPARENT) is uses Clear removable adhesive strips that can be easily removed from surfaces of your walls cleanly and does not damage your walls or leaves any sticky residue on it. 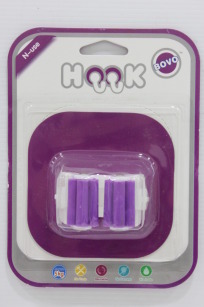 The hook is suitable for hanging temporary decorations and festive decorations as it can be removed when not in use. The hook is specifically designed for maximum adhesiveness between the hook and the surface giving it a higher weight rating compared to other hooks of similar size. 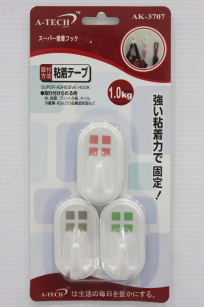 Available in 3 different hook sizes to suit user`s needs. 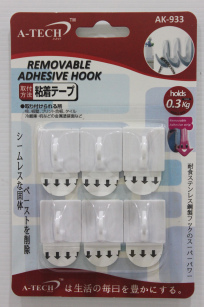 6PC REMOVABLE ADHESIVE HOOK is uses removable adhesive strips that can be easily removed from surfaces of your walls cleanly and does not damage your walls or leaves any sticky residue on it. 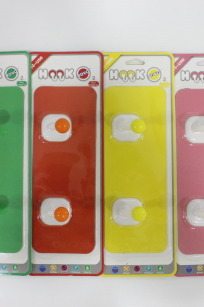 The hook is suitable for hanging temporary decorations and festive decorations as it can be removed when not in use. Great for hanging cloths & keys. 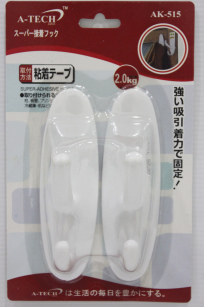 2PC ADHESIVE HOOK (LARGE) is the latest plastic hook series that is capable of supporting heavy weights. It has clean round designs and is made of tough plastic materials that give it strength and resistance to corrosion. Available in a Smaller size Variant. 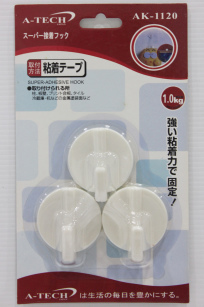 4PC ADHESIVE HOOK (SMALL) is the latest plastic hook series that is capable of supporting heavy weights. It has clean round designs and is made of tough plastic materials that give it strength and resistance to corrosion. Available in a Larger size Variant. 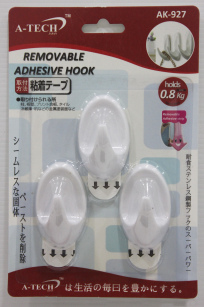 6PC REMOVABLE ADHESIVE HOOK uses a removable super adhesive tape that can be easily removed without leaving any damage or residue on the surface, The hook is clear and invisible when applied onto white walls making it great for hanging small objects. 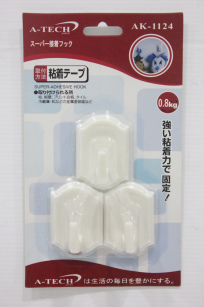 3PC REMOVABLE ADHESIVE HOOK – WHITE uses removable adhesive strips that can be easily removed from surfaces of the walls cleanly without causing any damage to the wall or surface applied on. It does not leave any sticky residue on the surface when the adhesive strip is removed. 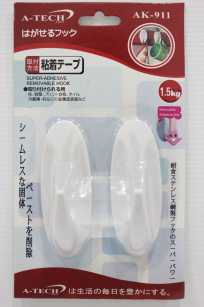 The hook is suitable for hanging temporary decorations and festive decorations as it can removed when not in use. Available in a assorted colours variant. 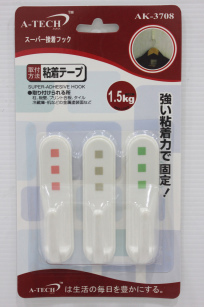 3PC REMOVABLE ADHESIVE HOOK – COLOURED uses removable adhesive strips that can be easily removed from surfaces of the walls cleanly without causing any damage to the wall or surface applied on. It does not leave any sticky residue on the surface when the adhesive strip is removed. 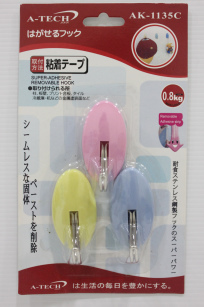 The hook is suitable for hanging temporary decorations and festive decorations as it can removed when not in use. Available in a assorted colours variant. 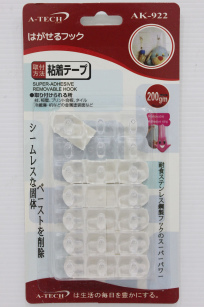 REMOVABLE ADHESIVE HOOK uses a removable super adhesive tape that can be easily removed without leaving any damage or residue on the surface, making it great for temporary hanging of decorations. It has a metallic hook that is extremely strong & durable capable of withstanding heavy loads. REMOVABLE PICTURE STRIPS – 4SETS (SMALL) is commonly known as picture / poster hanging strips. It comes in 4 sets of hook & loop strips (Velcro Strips) and can be easily removed from the surface by gently stretching the strip downwards. Best use for hanging pictures, posters on walls without the need for drilling & tools. Available in 3 different sizes to suit user requirements. REMOVABLE PICTURE STRIPS – 4SETS (MEDIUM) is commonly known as picture / poster hanging strips. It comes in 4 sets of hook & loop strips (Velcro Strips) and can be easily removed from the surface by gently stretching the strip downwards. Best use for hanging pictures, posters on walls without the need for drilling & tools. Available in 3 different sizes to suit user requirements. REMOVABLE PICTURE STRIPS – 4SETS (LARGE) is commonly known as picture / poster hanging strips. It comes in 4 sets of hook & loop strips (Velcro Strips) and can be easily removed from the surface by gently stretching the strip downwards. Best use for hanging pictures, posters on walls without the need for drilling & tools. Available in 3 different sizes to suit user requirements. 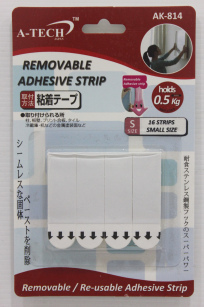 REMOVABLE ADHESIVE STRIPS – 16PC (SMALL) is a double sided adhesive that can be easily removed from the surface by gently stretching the strip downwards. Best use for replacing old adhesive strips of your common household hooks or simply use for hanging pictures, posters on walls without the need for drilling & tools. Available in 3 different sizes to suit user requirements. REMOVABLE ADHESIVE STRIPS – 12PC (MEDIUM) is a double sided adhesive that can be easily removed from the surface by gently stretching the strip downwards. Best use for replacing old adhesive strips of your common household hooks or simply use for hanging pictures, posters on walls without the need for drilling & tools. Available in 3 different sizes to suit user requirements. 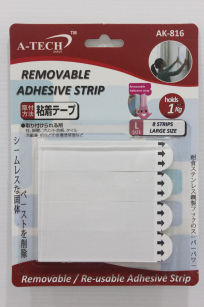 REMOVABLE ADHESIVE STRIPS – 8PC (LARGE) is a double sided adhesive that can be easily removed from the surface by gently stretching the strip downwards. Best use for replacing old adhesive strips of your common household hooks or simply use for hanging pictures, posters on walls without the need for drilling & tools. Available in 3 different sizes to suit user requirements. 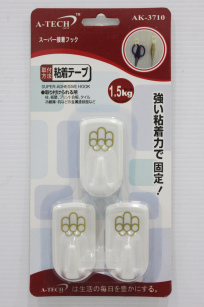 2PC ADHESIVE HOOK (SINGLE-HOOK) is the latest plastic hook series that is capable of supporting heavy weights. It has clean oval shape with thick hook designs and is made of tough plastic materials that give it strength and resistance to corrosion. Available in a double hook Variant. 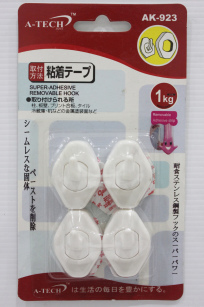 ADHESIVE HOOK (DOUBLE-HOOK) is the latest plastic hook series that is capable of supporting heavy weights. It has clean oval shape with thick hook designs and is made of tough plastic materials that give it strength and resistance to corrosion. Available in a single hook Variant. 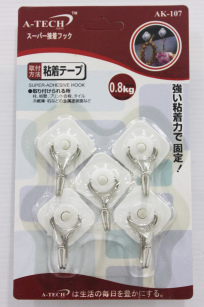 ADHESIVE UTILITY HOOKS (6 Hook) is designed to hang various different objects and is also capable of withstanding heavy weights, it is easy to apply and also has stainless steel hooks that are strong and rust resistant. 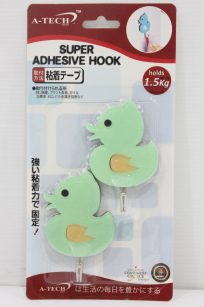 2PC ADHESIVE HOOK (DUCKY) is the latest glitter series hook that is capable of supporting heavy weights. It has ducky designs and is made of plastic materials. It has strong stainless steel hook legs that give it strength and resistance to rust. 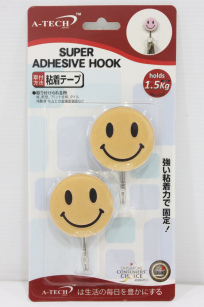 2PC ADHESIVE HOOK (SMILEY) is the latest glitter series hook that is capable of supporting heavy weights. 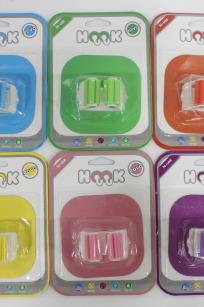 It has smiley-face designs and is made of plastic materials. It has strong stainless steel hook legs that give it strength and resistance to rust. ADHESIVE HOOK (WOODEN) is a unique wooden design adhesive hook that is capable of supporting heavy weights. It has cute emoji-like designs and is made of quality wood material. It has strong stainless steel hook legs that give is strength and resistance to rust. 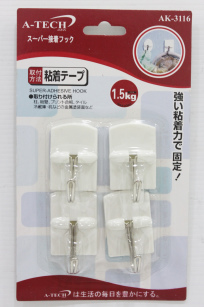 STICK-ON SINGLE HOOK – (NANO SUCTION) is designed for space saving and innovative ways to secure objects onto smooth surfaces without leaving traces of residue/stains or drilling of holes. It can hold up to 5kg and has a tough ABS Plastic Hook Its unique Nano-Suction silicon pad is also removable & reusable. Comes in Vibrant Assorted Colours. 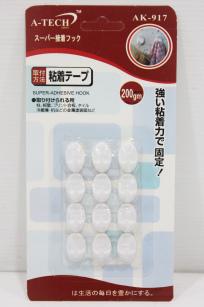 STICK-ON DOUBLE HOOK – (NANO SUCTION) is designed for space saving and innovative ways to secure objects onto smooth surfaces without leaving traces of residue/stains or drilling of holes. It can hold up to 5kg and has a tough ABS Plastic Hook Its unique Nano-Suction silicon pad is also removable & reusable. Comes in Vibrant Assorted Colours. 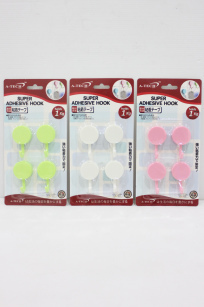 STICK-ON RECTANGLE HOOK – (NANO SUCTION) is designed for space saving and innovative ways to secure objects onto smooth surfaces without leaving traces of residue/stains or drilling of holes. 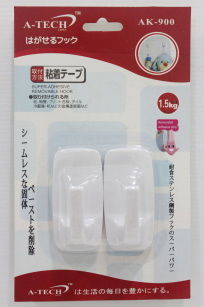 It can hold up to 5kg and has a tough ABS Plastic Hook Its unique Nano-Suction silicon pad is also removable & reusable. Comes in Vibrant Assorted Colours. 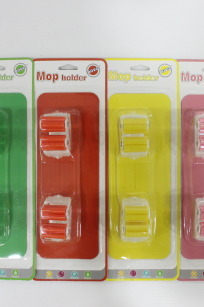 STICK-ON MOP HOLDER – (NANO SUCTION) is designed for space saving and innovative ways to secure objects onto smooth surfaces without leaving traces of residue/stains or drilling of holes. 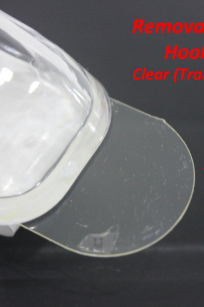 Its unique Nano-Suction silicon pad is also removable & reusable. 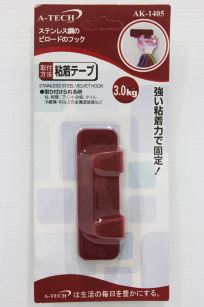 Perfect for securing brooms, mops, dust pan and various cleaning tools. 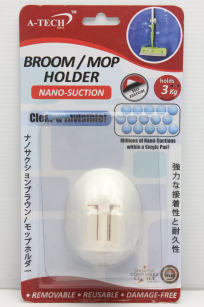 STICK-ON DUAL MOP HOLDER – (NANO SUCTION) is designed for space saving and innovative ways to secure objects onto smooth surfaces without leaving traces of residue/stains or drilling of holes. Its unique Nano-Suction silicon pad is also removable & reusable. Perfect for securing brooms, mops, dust pan and various cleaning tools. 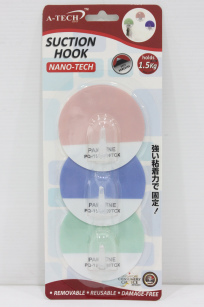 NANO SUCTION HOOK (3PC) is designed for space saving and innovative ways to secure objects onto smooth surfaces without leaving traces of residue/stains or drilling of holes. It can hold up to 1.5kg and has pantone colour pads. Its unique Nano-Suction silicon pad is also removable & reusable. 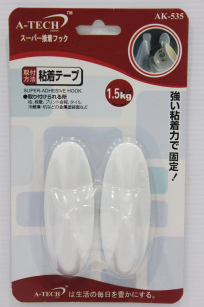 NANO SUCTION HOOK is made with high quality Synthetic Rubber Silicon (SRS) also known as Nano Suction. 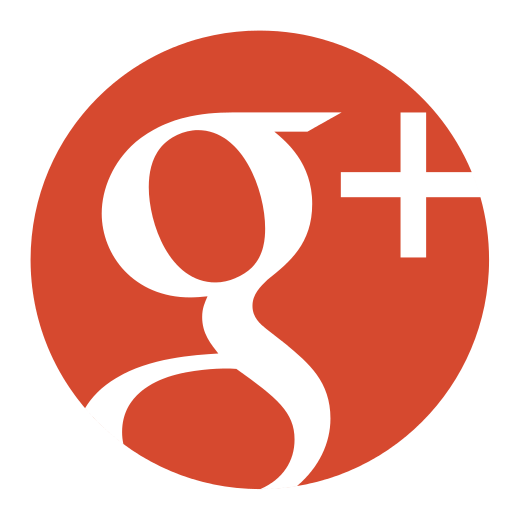 It is removable and does not damage the application surface. 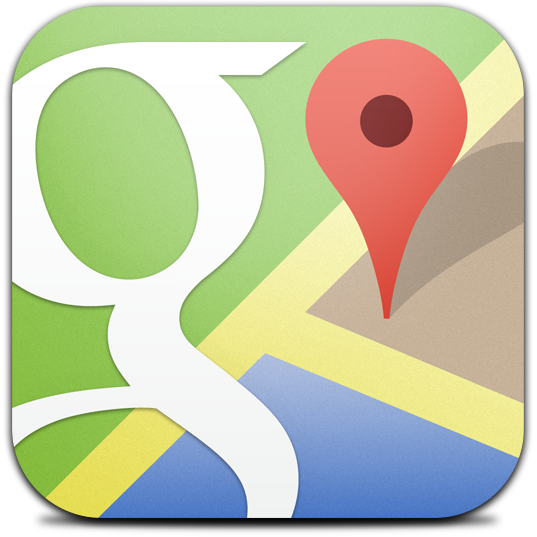 It can be washed, re-use and relocated to a different location. Comes in 10 unique cartoon designs. 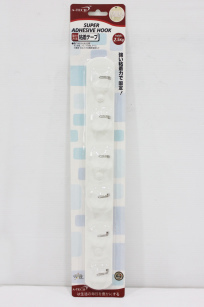 NANO SUCTION TOOTH BRUSH HOLDER is an innovative product that makes use of Synthetic Rubber Silicone pads (SRS pad) to mount the Holder onto surface like tiles, glass or any other smooth and non-porous Surfaces. The pad can be removed, washed and re-use again. The Holder can be easily removed from the SRS pad for cleaning and then attached back without any complicated tools required. 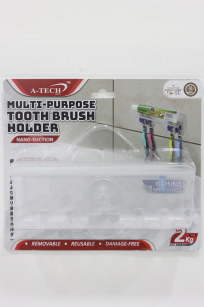 It has a small platform top that allows you to place objects such as toothpaste etc making it more practical compared to conventional holders. The product is clear colour making it almost invisible and able to match all types of design themes. It is strong and able to withstand up to 2Kg weight. 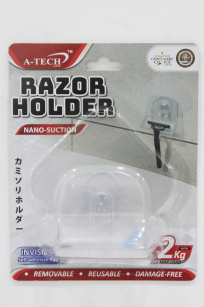 NANO SUCTION RAZOR HOLDER is an innovative product that makes use of Synthetic Rubber Silicone pads (SRS pad) to mount the Holder onto surface like tiles, glass or any other smooth and non-porous Surfaces. The pad can be removed, washed and re-use again. The Holder can be easily removed from the SRS pad for cleaning and then attached back without any complicated tools required. 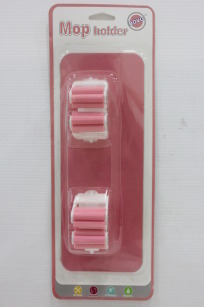 It has a elegant curved surface that fits all general types of razors. The product is clear colour making it almost invisible and able to match all types of design themes. It is strong and able to withstand up to 2Kg weight. 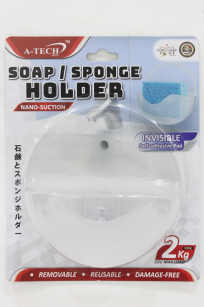 NANO SUCTION SOAP / SPONGE HOLDER is an innovative product that makes use of Synthetic Rubber Silicone pads (SRS pad) to mount the Holder onto surface like tiles, glass or any other smooth and non-porous Surfaces. The pad can be removed, washed and re-use again. The Holder can be easily removed from the SRS pad for cleaning and then attached back without any complicated tools required. It has a unique U-shape that allows it to fit objects like soap, sponge and many other common bathroom/kitchen objects. It has small drainage holes at the bottom to effectively drain out water to prevent water accumulating at the bottom. The product is clear colour making it almost invisible and able to match all types of design themes. 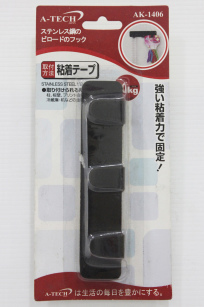 It is strong and able to withstand up to 2Kg weight.